According to Professor William Shea, a startling find from Babylon may record the actual names of Daniel's three friends; Hananiah, Mishael and Azariah. "Now from among those of the sons of Judah were Daniel, Hananiah, Mishael, and Azariah. To them the chief of the eunuchs gave names: he gave Daniel the name Belteshazzar; to Hananiah, Sha-drach; to Mishael, Meshach; and to Azariah, Abed-Nego." Found on the list is the name Ardi-Nabu, official of the royal prince. This name is the equivalent to the Aramaic name Abednego and may in fact be the first mention of one of Daniel's friends found outside of the Bible. Another name found on the list is Hanunu, Com-mander of the king's merchants. The name Hanunu may be the Babylonian equivalent for the Hebrew name Hananiah. Another name inscribed on the list is Mushallim-Marduk, who was an official to Nebuchadnezzar. Marduk was the name of a Babylonian god. If Marduk is left out of the name, we wind up with Mushallim which may refer to Mishael. Notice that each of these men held an adminis trative position in Babylon. The Bible in Daniel 2:49 states: "Also Daniel petitioned the king, and he set Shadrach, Meshach, and Abed-Nego over the affairs of the province of Babylon; but Daniel sat in the gate of the king." The remarkable story of why Daniel's three friends were promoted to such high positions can be found in Daniel Chapter 3. 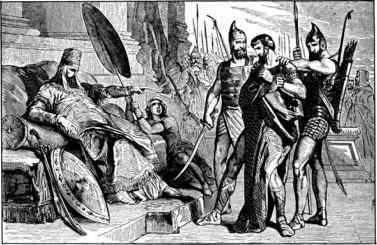 King Nebuchadnezzar of Babylon constructed a huge golden statue ninety feet high and nine feet wide. Liberal Bible scholars have attacked this in the past saying that the technology to build a statue that size could not have existed at that time. But we now know, that early in history, the Colossus of Rhodes was built, a huge bronze statue of Apollo that stood at the entrance to the seaport at Rhodes, an Island in the Mediterranean Sea. The statue was even bigger than the one Nebuchadnezzar built, so large in fact that sailing vessels rigged to the mast could easily pass underneath its legs. The Bible says that Nebuchadnezzar gave an empire wide decree that everyone must come and bow down and worship before the golden image he had made. Those who did not, would be thrown into a blazing furnace. Daniel's three friends would not, and they said to the king: "O Nebuchadnezzar, we have no need to answer you in this matter. "If that is the case, our God whom we serve is able to deliver us from the burning fiery furnace, and He will deliver us from your hand, O king. "But if not, let it be known to you, O king, that we do not serve your gods, nor will we worship the gold image which you have set up." 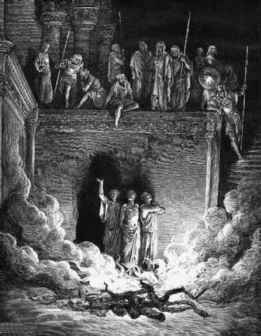 Shadrach, Meshach, and Abed-Nego, and cast them into the burning fiery furnace. Then these men were bound in their coats, their trousers, their turbans, and their other garments, and were cast into the midst of the burning fiery furnace. Therefore, because the king's command was urgent, and the furnace exceedingly hot, the flame of the fire killed those men who took up Shadrach, Meshach, and Abed-Nego. And these three men, Shadrach, Meshach, and Abed-Nego, fell down bound into the midst of the burning fiery furnace. Then King Nebuchadnezzar was astonished; and he rose in haste and spoke, saying to his counselors, "Did we not cast three men bound into the midst of the fire?" "Look!" he answered, "I see four men loose, walking in the midst of the fire; and they are not hurt, and the form of the fourth is like the SON OF GOD." Then Nebuchadnezzar went near the mouth of the burning fiery furnace and spoke, saying, "Shadrach, Meshach, and Abed-Nego, servants of the Most High God, come out, and come here." Then Shadrach, Meshach, and Abed-Nego came from the midst of the fire. And the satraps, administrators, governors, and the king's counselors gathered together, and they saw these men on whose bodies the fire had no power; the hair of their head was not singed nor were their garments affected, and the smell of fire was not on them. Nebuchadnezzar spoke, saying, "Blessed be the God of Shadrach, Meshach, and Abed-Nego, who sent His Angel and delivered His servants who trusted in Him, and they have frustrated the king's word, and yielded their bodies, that they should not serve nor worship any god except their own God! "Therefore I make a decree that any people, nation, or language which speaks anything amiss against the God of Shadrach, Meshach, and Abed-Nego shall be cut in pieces, and their houses shall be made an ash heap; because there is no other God who can deliver like this." Then the king promoted Shadrach, Meshach, and Abed-Nego in the province of Babylon.